Bruce Pearl is not now and never has been a shrinking violet. Right now, he's got his Auburn Tiger squad in the same mindset. Dudes are surprising their Dance opponents on a gamely basis. Fans, administrators, and overall detractors can say what they will about John Calipari -- and they do every chance they get -- but dude knows how to instantly tourney-harden underclassmen on an annual basis. The 'Cats took note, tweaked a thing or two, and then ka-rushed their feisty foes in Lexington, 80-53. Now, they're moving to a neutral court with their respective seasons on the line. Speaking of, Bovada has set the line for this one at Kentucky -5, the total at 143, and the moneyline at Auburn +180 and Kentucky -220. For one, take a look at their neutral court record: 10-1. Those games are either played against quality opposition or in elimination scenarios. The Tigers rise to the occasion in big games. Dudes do it from downtown. Auburn's one of the country's most prolific sharpshooters from beyond the arc, with Bryce Brown and Jared Harper doing the most damage. Looks like they'll be missing a key component with Chuma Okeke injured. He was a major factor in their taking down both Kansas and North Carolina, and how they compensate inside will be a huge factor. A key reason for the Wildcats' sweep of Auburn was their virtually total dominance on the boards. Kentucky collectively out-rebounded the Tigers, 75-50, with Keldon Johnson, Reid Travis, and PJ Washington in constant beast mode. Johnson and Washington also have range that extends to the arc, which has been useful in softening their opponents' packed-in defenses. The Wildcats shot over 54% against Auburn this season; if Okeke can't play, there's a strong possibility that'll happen again. Prior to Auburn doing it, no team has ever conquered both the Jayhawks and Tar Heels in the same NCAA tournament. It's a sign that they're living in the moment and thriving on it. 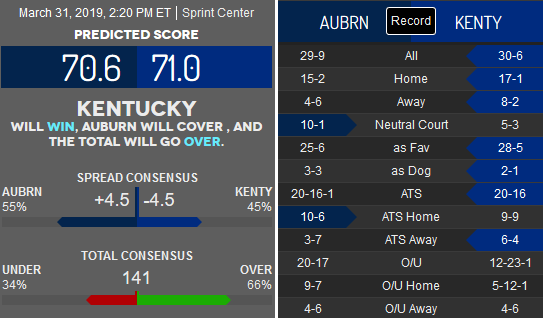 With the neutral court factor and considering their loss in Lexington was a sobering reality that nothing less than their best will do, odds are strong that this game will more closely resemble the result in Auburn. This game should go down to the wire.